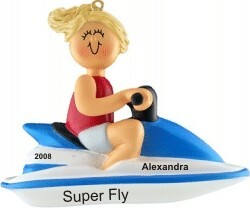 Commemorate the fun experienced on a personal watercraft with the jet ski female blonde hair personalized Christmas ornament in cute style and cheerful colors. Our lettering pros add your custom details to these hobby ornaments personalized in an attractive font, and brunette and male Caucasian versions are also available. Celebrate riding the waves, wind in hair, with the female blonde on jet ski personalized Christmas ornament that we ship in our plush and lovely drawstring pouch. Keepsake ornaments Feb 16, 2015 Bonny T.